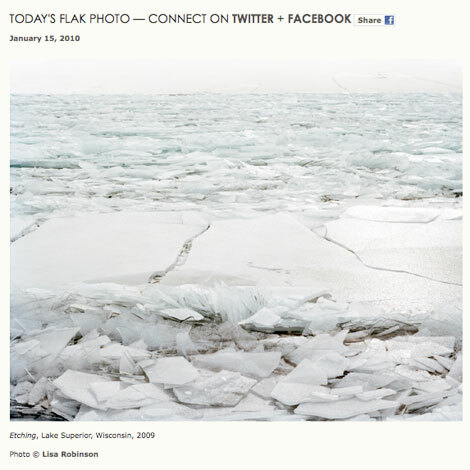 When Andy Adams of Flak Photo first put out a call to the online photography community looking for images of winter, the first photographer that came to mind was Lisa M. Robinson and her Snowbound series. 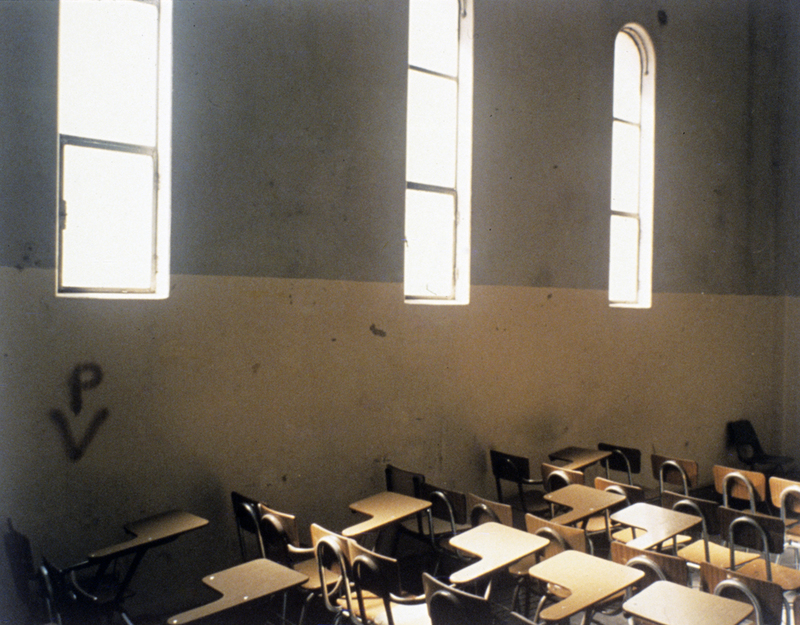 I first came to know Lisa’s work from the Winter 2007 issue of the Photo-eye Booklist. I was transfixed by the frozen natural ice sculptures of “Valhalla” on the cover, the interview with her by Patrick Amsellem (page 16), and one photograph that looked to be of tiny colored dots on a white background that almost blended into the white of the magazine page (page 19). I could barely decipher the image, but could not stop looking at it. Sadly to say, that was the last printed issue of the Photo-eye Booklist with Darius Himes as Editor, but that horizon-less photograph of fishing huts started my photograph collection. It wasn’t until much later that I was able to see more of her work in person with Debra Klomp Ching of KlompChing Gallery in DUMBO. Her inclusion in Flak Photo’s weekday series WINTER PICTURES presented a perfect opportunity to ask Lisa more about her work. I corresponded with Lisa from my snowed-in home in Virginia, while she soaked up the sun in mild Arizona. We talked about her Fulbright to Argentina, the reality of photographing in snow, and the new body of work selected by Andy Adams for his online exhibition. Larissa Leclair: What was your Fulbright proposal that took you to Argentina? Did you go as a photographer? 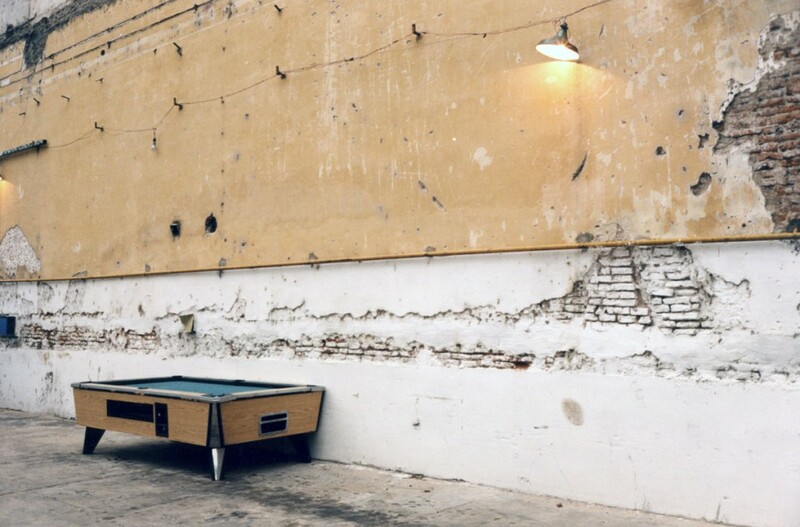 Lisa M. Robinson: I fell in love with Argentina in 1994, when I lived there for a year. I admired the Argentine spirit that seemed to be optimistic and pure, no matter the circumstance. Interestingly, I had proposed a photographic portrait of the people, in an effort to better understand such complexities. But in the span of time between my proposal and my arrival, my photographic interests had shifted, and I found myself drawn to the private and public spaces that still reverberated with a human presence. 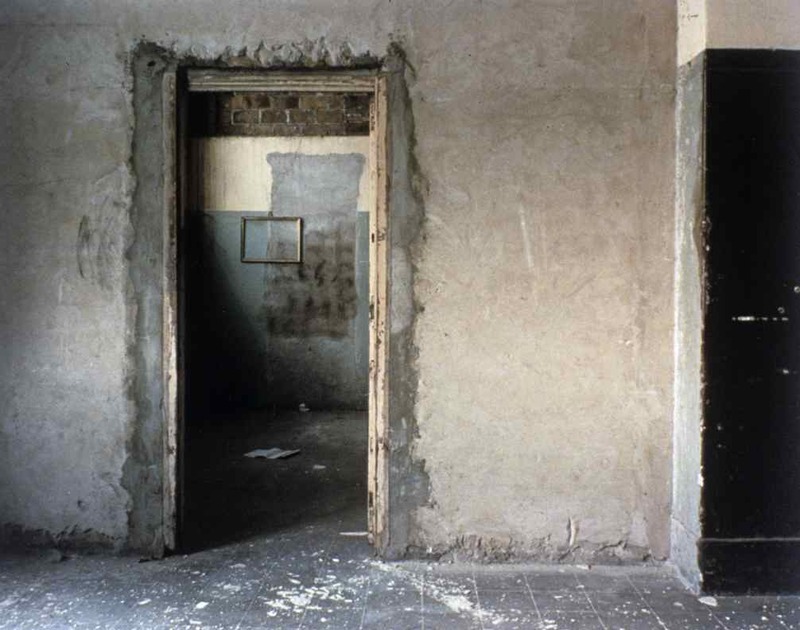 I could not experience these spaces without recognizing some hint of the past, and made photographs that investigated light and darkness as metaphors for deeply layered lives. The resulting images are quiet, poetic ruminations on the significance of seemingly familiar moments. LL: How have you tapped into very international and diverse venues for showing your work — the International Photography Gathering in Aleppo, Syria; the Museo Tambo Quirquincho in La Paz, Bolivia; and Kaunas Photo Days in Kaunas, Lithuania? And the U.S. Embassy in Kazakstan has your work in it’s collection. Which ones? LMR: I began showing the Snowbound series in 2005, while still in the midst of the project.Â I was living in New York, and took advantage of every opportunity to get my work in front of people. I think the international opportunities arose primarily from various portfolio review events â€“ FotoFest, PhotoLucida, Rhubarb-Rhubarb. These meeting grounds allowed me to share my work with a broad spectrum of curators, gallerists and editors. I was surprised to find how profoundly these images seemed to resonate for people from such different cultures. I thought the work to be distinctly American, emerging from a suburban sensibility and rooted in a combined tradition of the New Color photographers and the New Topographics. While I appreciated how many more concepts informed the imagery, I didnâ€™t fully expect others to see or feel what I did. Itâ€™s kind of like believing that your own baby is beautiful, while recognizing that you canâ€™t help but have a particular bias. The international receptivity to the images reminds me of the universal language and power of photography to evoke the specific and the immense simultaneously. â€œSoloâ€� and â€œHarmonyâ€� are prints in the collection of the U.S. Embassy in Kazakstan. One is an image depicting a lone basketball hoop in snow; the other, a baseball backstop. These sports are iconic representations of American culture, but the stillness of these playing fields under a blanket of snow suggests a more introspective moment. 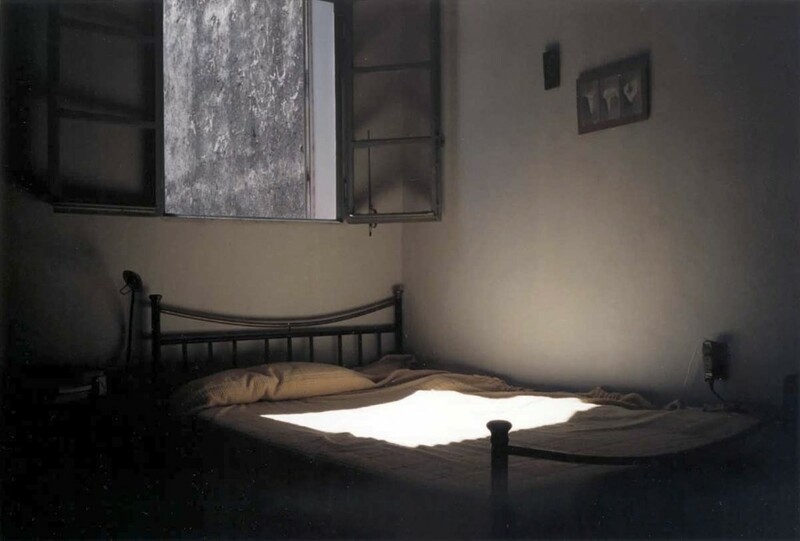 LL: Tell me about the photograph “Wish” — which is the cover image of your monograph by Kehrer Verlag. LMR: From the beginning of the Snowbound work, I recognized that I was drawn to elements in the landscape that provided a point of human reference, perhaps as a source of comfort and familiarity in an otherwise unfamiliar world. But as the project deepened, I began to read my images in a different way, on a more metaphorical plane. 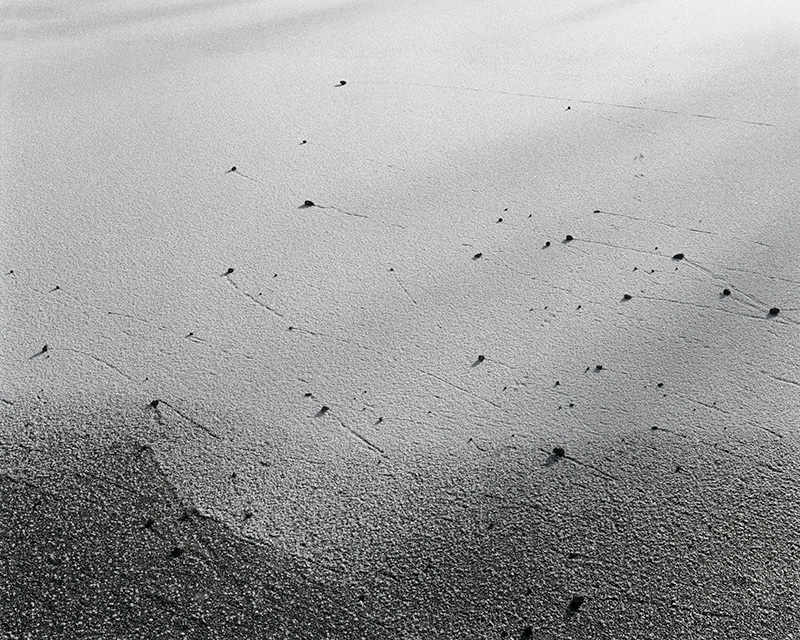 I began to see the connections that had slowly emergedâ€¦ not only was I drawn to human elements isolated in the snowy landscape, but also to spaces that suggested a time of year that had passed, or an activity that was now suspended. â€œWishâ€� was one such image. The very discovery of it functioned like the work itself. I wasÂ traveling through Utah, looking for frozen lakes in hopes of discovering more ice fishing shacks. I had called a local outfitter store to find out which lakes might freeze over, and had been directed to this summer location. Driving across the snow and ice toward this designated space on the map, I was a bit skeptical. Eventually, though, the road opened up and I could see a lake in the distance, across a mile or two of snow. I parked my car, and as I was lacing up my bunny boots, preparing for the long trek ahead, a pick-up truck stopped and a local resident asked with grave concern if everything was okay. â€œSure is,â€� I said. â€œIâ€™m headed out there to photograph.â€� He was perplexed, and didnâ€™t quite understand why I would be tromping off into nothingâ€¦ â€œIn the summer, this place is full of people,â€� he said. â€œBut thereâ€™s nothing there now. 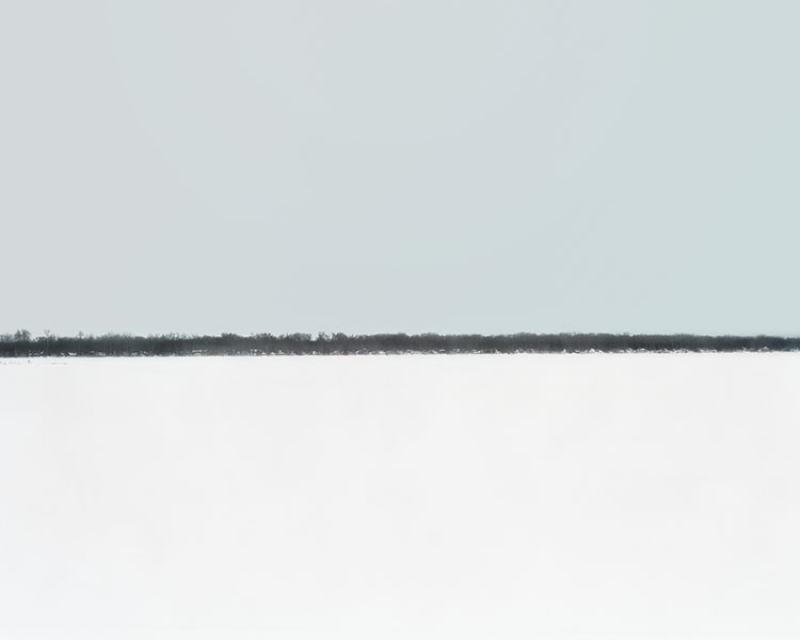 Itâ€™s all covered in snow.â€� “Precisely my interest,â€� I thought.Â I had encountered a Rothko-esque landscape, and was going to approach the horizon in order to capture this painterly reality. And as I trekked through the snow, which was up to my knees, approaching the waterline, I could see a black dot in the distance, a dot that grew larger and larger. I thought that it might be a trashcan, and was speechless when I realized that I was standing before a sunken picnic table. It was a perfect moment, the top of the table pristine from previous sunny days, but its legs submerged in snow. My Rothko painting had been punctuated by a memory. Time and space, form and color were all suspended here, in this moment. I feel privileged to have been a witness, and to have made this resulting image. LL: The images are peaceful and calm – probably not at all adjectives you would use to describe the winter conditions you were photographing in. What was it like to work in the snow physically and mentally? LMR: I donâ€™t think I chose to photograph snow and ice, as much as I recognized that it lured me with its understated beauty. I remember late one Sunday afternoon, walking across a frozen lake in Maine, heading toward an isolated fishing shack. A cloud passed over the sun, and in an instant, the gently falling snow began to be driven horizontally. The wind had come from nowhere, and the snow stung like icy pellets. The scene before me was sublime –Â a hand-crafted shelter silently acquiescing to the storm, like a patient sage. At the same time I was being beckoned by this scene, I was confronted by its physical difficulties. I gave up trying to make a photograph that day, my fingers numb from immediate exposure to the wind and cold. I remember defrosting in my car, frustrated but compelled by the challenges ahead. I knew that I must confront the storm, and its attendant challenges and difficulties, in order to find that still center. Learning to embrace the physicality of the work — finding the proper clothing and gear, learning how to read the atmosphere, developing a methodical ritual with my 4×5 view camera, learning the rhythm of my breath in pace with my steps as I walked through snow — all of this was essential to my understanding of this quest. It is no accident, then, that I became deeply meditative through the act of photography. Often, I would wake an hour before sunrise, in order to light a candle and write in my journal, as a way of finding an internal equilibrium that could be maintained throughout my external experience. I began to practice yoga, and developed an awareness of my body and its connectedness to an outer world that, I believe, manifests in the images themselves.Â Walking that edge, where the tension between the physical reality and the internal peace, can co-exist, has resulted in images that can sustain such seeming contradictions. Somehow, the blizzard is manageable, when you are inside your own head and inside the storm at the same time. Such cold, such seeming emptiness, the unknown space before meâ€¦ I went into it alone, without a guide.Â No one knew where I was, often times not even myself. That was part of this journey, to confront the unknown, to confront myself, and to glean something from the experience. LL: You are now in Arizona. Do you miss that kind of snow and winter? LMR: I never realized how much the winter experience had become a part of me until I no longer had it in my life. You donâ€™t miss your water â€˜til your well runs dryâ€¦ I have spent the last year and a half re-calibrating my inner compass in order to learn from this new landscape and spaciousness. Living far from the sea, from natural bodies of water, has certainly been challenging, and 70 degree winters confound me (though I canâ€™t complain about the long bike rides through the Sonoran mountains). My yearning has compelled me to travel a bit, seeking out the places and atmospheres that I miss. LL: What brought you to the southwest? LMR: Loveâ€¦ I fell in love with a man from Tucson who couldnâ€™t relocate, so I moved to his world. 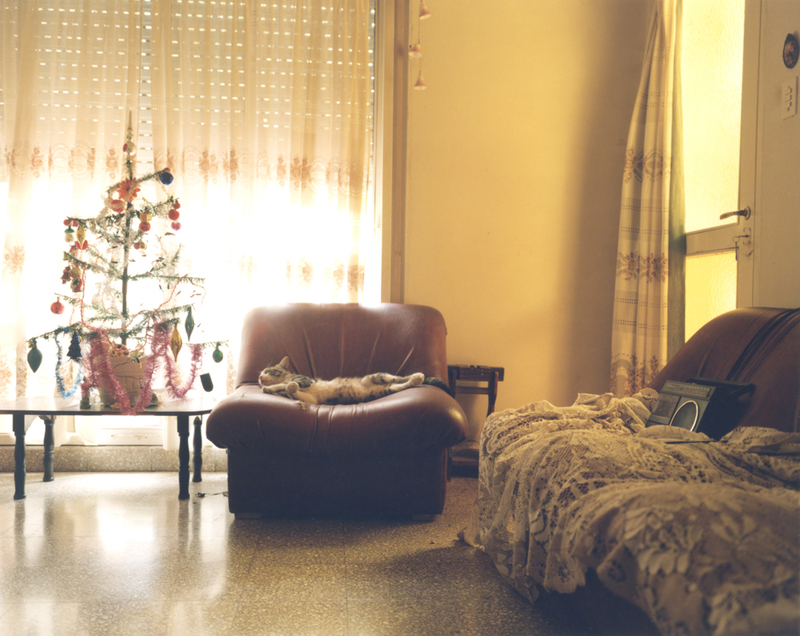 LL: The work selected by Andy Adams for WINTER PICTURES featured on Flak Photo is from a new series. Can you tell me a little about it? 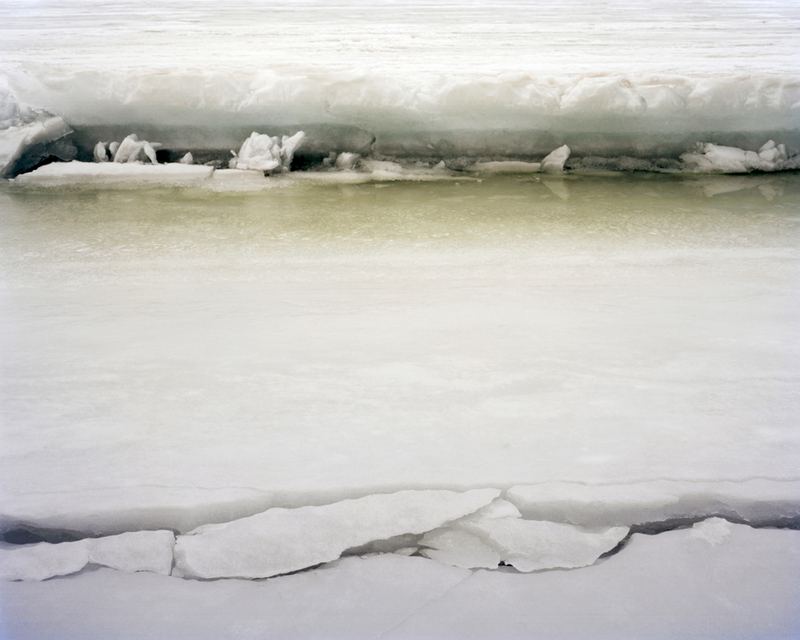 LMR: During the last two winters of the Snowbound work, I was especially drawn to areas of water, where this primary element existed in multiple states, often simultaneously. This new series has taken water as its starting point, perhaps because I have yearned for the vastness of the sea at the same time that I am trying to embrace the mystery of the desert. There is a deep history embedded in the land here, a past that is characterized by oceans and water, but only suggested by the traces left behind. Walking through the Sonoran desert, one can almost sense being on the floor of an immense sea, where cacti are like anemone. I am seeking a connection between the water and the land, trying to understand a larger arc.Â This search is taking me from tumultuous water to the frozen edges, from desert tundra to underground formations. The image in WINTER PICTURES is one of transition, illustrating stillness and movement, that nearly imperceptible shift in time and space that underlies every passing moment. LL: Thank you Lisa very much. Lisa M. Robinson is represented by KlompChing Gallery (NY) and Etherton Gallery (AZ). 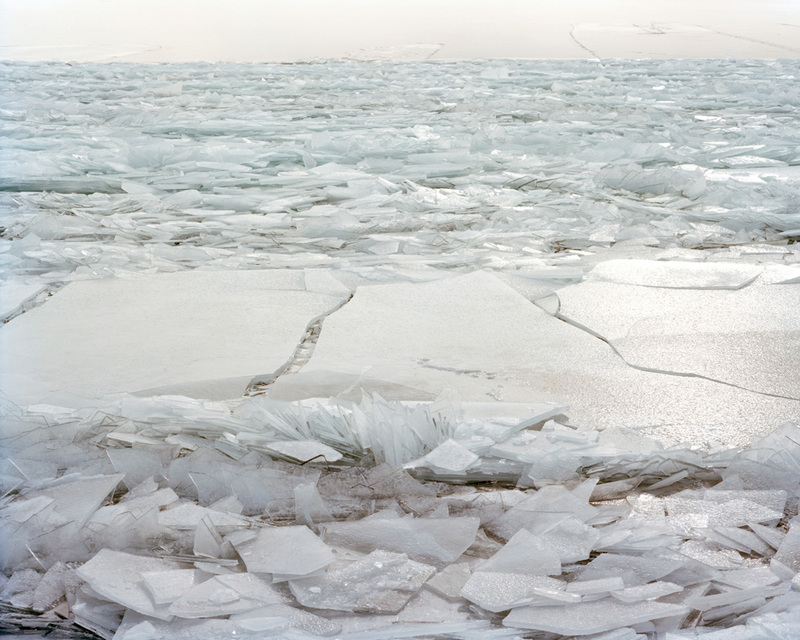 Her monograph is Snowbound (Kehrer Verlag, 2007). Click here to visit Lisa’s website and also check out the interview by NYMPHOTO. You are currently reading Interview: Lisa M. Robinson at Larissa Leclair.